Saitek gear has had a very limited supply chain for more than a year now, and it’s making the aftermarket for some stuff a bit ridiculous. One of those things is the power adapter for the Saitek Pro and Cessna yokes, which are either on multiple-month backorder or being sold by some people on eBay for (the outrageous price) of $70 or more US. No need to pay that, and I certainly wasn’t going to. Instead, I went to my local PC shop and bought a universal AC adapter that allowed me to match the ratings of the Saitek yoke. The Saitek Pro yoke needs voltages between 100 and 240 volts AC at 50-60 hertz, and the output is fixed at 5 volts and 2000 mA (2 amps). This is good as you need about 500 mA per USB device plugged into the yoke (or any USB hub you hope to use, for that matter). 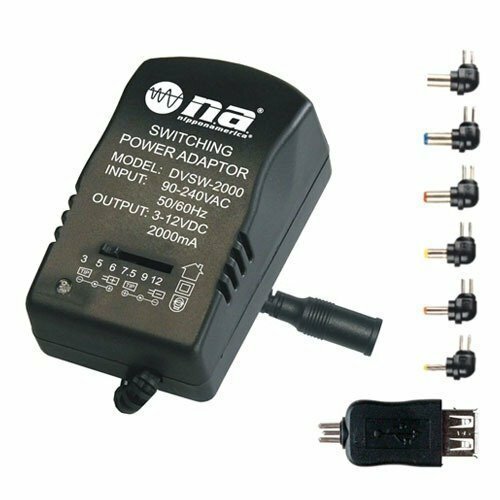 Given that, the Nippon America 2000mA Universal Adapter Multiple AC 3v 5v 6v 7.5 9v 12v should do the trick, and it’s available in the US at least at Amazon for $12.67. This is similar, but not the same, as the one I have, and it’s nice because it allows you to set multiple voltages, has multiple tips, and the tips are switchable so you can have the polarity positive outside or inside. There are other units available – just be certain the voltages, mAmps, and polarity are right. I don’t power my Saitek Pro Flight yoke but I do plug it into a powered USB hub. The only thing I have plugged into the yoke is on throttle quadrant by the game port not USB. Is there a need or advantage to powering the yoke or is this a different yoke? As long as everything is working correctly you’re fine. But if you plug FIPs or other power-hungry devices into it, it will probably act erratically without its own power source. Considering the number of devices you have running in your setup and the various power requirements did you have to add any additional circuits in your house to handle the extra load? I would like to eventually build a setup similar to what you have done but I’m not sure one circuit breaker could handle it all. I did not. They’re all running off two outlets and the same circuit, although I have two different surge protected power strips between the devices and the outlets. Power from the wall hasn’t been a problem so far. Greetings all. I followed the link above and purchased the switching power adapter. Although the adapter lists the correct voltage, it does not work for the Saitek Yoke (Cessna or Pro). It does not come with a tip that is suitable for the Yoke. There is one tip that I can force into the yoke. When it makes contact inside of the receptacle, it kills the power on the yoke (I checked polarity to ensure a positive tip). I attempted to purchase two Saitek Adapters off of eBay as well. Although it reads Saitek on the adapter with the correct voltage listed (6V 2A), the shaft on the tip of the adapter is not long enough to reach into the hole on the yoke. When i press it in very hard, the metal just barely makes contact. Can anyone assist with a solution? Thanks in advance. I am glad you posted this, I was about to purchase the power supply. I have 8 saitek panel instruments for the 8 pack, and I don’t have enough power with these cheap usb power hubs I bought from Best Buy. They say 5A but this still isn’t enough power. I need something with lots of power.